I like being an adult. I can eat what I want, wear what I want, sleep when I want, and say all the curse words I want. But I also have to have a job, pay bills, clean up after myself, and force conversation with people I have to pretend to like. Then there is the world that’s in between: the place where childhood and the adult world collide. The very best collisions leave an indelible mark on our cultural landscapes (and involve baby talk). Best theatrically dressed pop star: Lady Gaga. Best chain of convenience stores: Wawa. Best early 20th century art movement: Dadaism. Best foreign language phrase that means “yes”: oui oui. 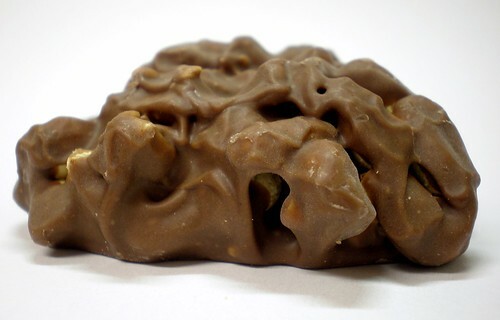 And best (or at least very good) confection combining milk chocolate, peanuts, caramel, and marshmallows: Goo Goo Clusters. 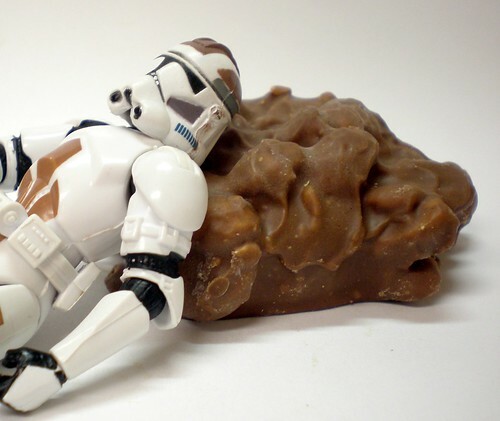 This little chocolate-covered mound of happiness was purchased in the Country Music Hall of Fame gift shop. It was brought to me by a friend of the blog vacationing in the state of Tennessee. A proud land from which my forefathers descended, and one that lies a little too close to Kentucky for me to ever visit again. 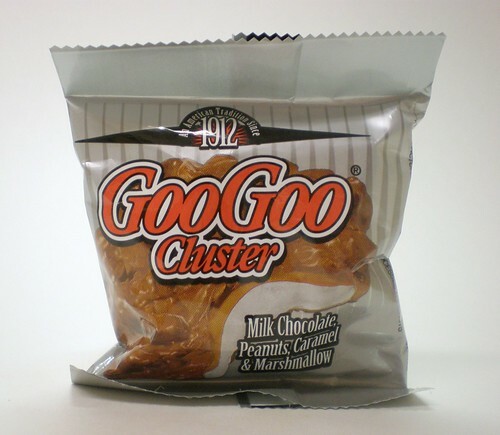 Apparently, Goo Goo Clusters, like Dadaism, go way back to the beginning of the 20th century. I had never heard of them, much less enjoyed one, until I chomped my way through this Goo Goo Cluster Original. This is an enjoyable snack food. The chocolate won’t change your life, but it is good, and actually chocolate. The amount of peanuts is just right and provides some great salt content. 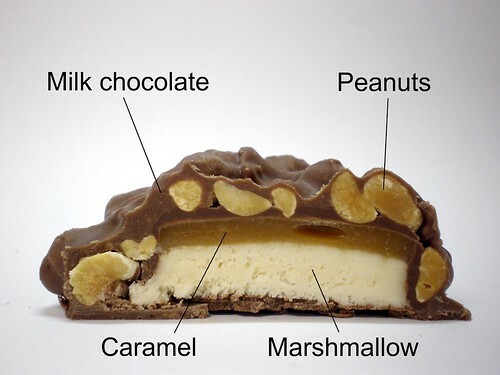 The caramel and marshmallow (which I am usually not a fan of, but gets folded in nicely so as not be distracting) provide just the right amount of chewiness. The formula is dead on. The ratio is very satisfying. What there should be more of, there is. And what there should be a little less of, there also is. The size of these is also perfect. One cluster provides a perfectly satisfying sweet treat while not going overboard. That must still be a remnant of there 1912 design, as I’m sure if they were invented today there would be a King Size version the size of a hubcap. I must admit when I heard the name of the product, I expected a gross, indecipherable amalgam of sub-par ingredients. But these are good. You should go buy some. Who’s gonna buy some? Who’s gonna by some Goo Goo Clusters? You are! Yes you are! You’re gonna buy some Goo Goo Clusters! You’re so cute! Yes you are! I use to see these all the time growing up, but have not seen them since. There is also one with peanut butter and one with pecans. As always your reviews bring back memories and get me laughing until I wet myself. I wish the Dollar Tree still sold them. Oh, I haven’t had one of these in ages! Lovely shot of the cross section, by the way. As a reader from Kentucky, I feel the need to comment and express my displeasure for your s…oh, what am I saying, this state is pretty bad. Love these candies though, and love your blog! Goo Goo Clusters WRE my favorite. I bought one recently and thought it had gone bad, It tasted ‘different’ from what i remember , not very good. Then I just read that they are now made using a new recipe, changed some ingredients, I HATE IT , WISH they would bring back the old recipe it was better. And the price is now a lot higher.